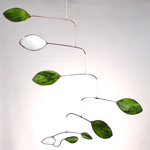 Hanging Mobiles featured in this gallery are detailed copper wire work on each vane. 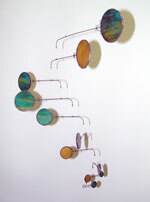 I form the copper using a variety of hand tools and homemade jigs. The individual metal components are then hammered to add in some texture. My patterns are drawn directly onto the stained glass and I use the natural grains and colors of the glass to create the designs. The glass is then scored with an oiled carbon wheel and chipped away with pliers. 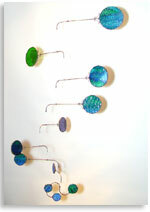 I also use a variety saws and grinders to cut inside curves and to prepare the stained glass edges for the copper foil. 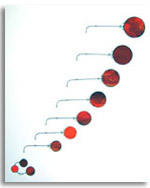 My glass mobiles are then assembled together using lead-free silver solder. 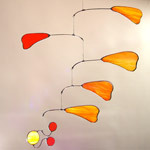 I use nylon line to suspend the individual vanes and counterweight of the stained glass mobiles together. 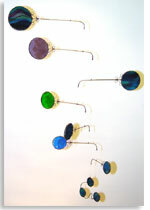 Nylon enables each vane of the mobile to spin in 360 degrees motion and independently of each other. 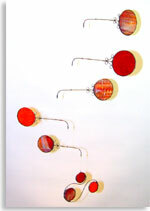 Nylon offers an eloquence of movement that can not be obtained with wire. Wire does have greater longevity and is available upon request.